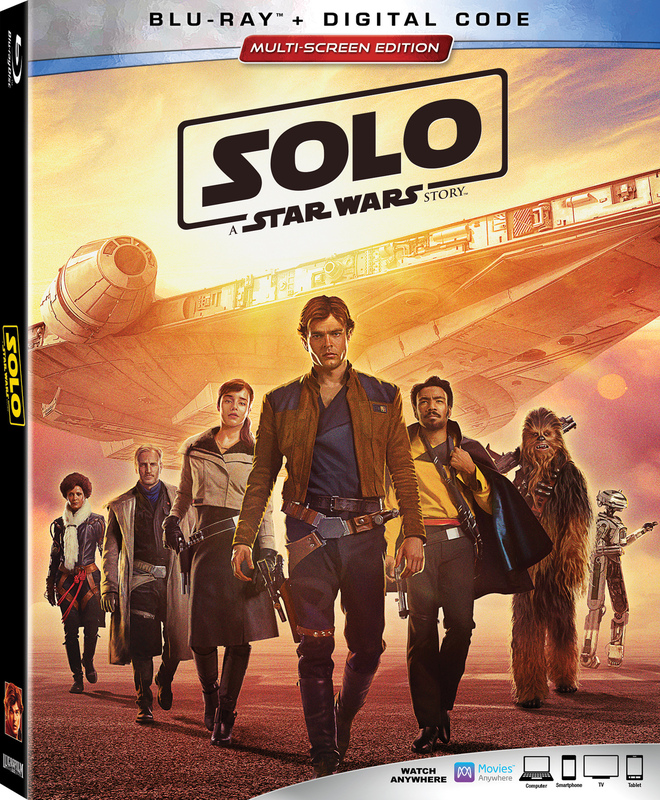 Bring home Lucasfilm’s “Solo: A Star Wars Story” on Blu-ray 4K Ultra HD, Blu-ray, DVD and On-Demand Tuesday Sept. 25. Directed by Academy Award winning filmmaker Ron Howard, the sci-fi space adventure takes viewers on a wild ride with the most beloved scoundrel in the galaxy, Han Solo (Alden Ehrenreich, “Hail, Caesar!”). The action-packed journey explores Han’s first encounters with future friend and copilot Chewbacca (Joonas Suotamo, “Star Wars: The Last Jedi”) and notorious gambler Lando Calrissian (Donald Glover, “Atlanta”), as well as his adventure-filled past alongside fellow street thief Qi’ra (Emilia Clarke, “Game of Thrones”) and career criminal Beckett (Woody Harrelson, “Hunger Games” franchise). The hit summer movie also is available now digitally in HD and 4K Ultra HD and on Movies Anywhere. “Solo: A Star Wars Story” bonus content takes fans behind the scenes to experience compelling discussions with the star-studded cast and screenwriters Lawrence Kasdan (writer of “Star Wars: The Empire Strikes Back” and “Star Wars: Return of the Jedi) and his son Jonathan Kasdan; a revealing feature on Chewbacca and his enduring friendship with Han; a close-up look at the original version of the Millennium Falcon and Han’s first time piloting the infamous ship; the creation of the film’s otherworldly settings and pulse-pounding action sequences; and eight never-before-seen deleted and extended scenes. Prepare for invasion when the sci-fi epic “Occupation” arrives on Blu-ray + Digital, DVD and Digital Tuesday Sept. 25 from Lionsgate. This film currently is available On Demand. When a fleet of spaceships cover the sky in darkness and invade Earth, a small group of civilians band together to fight off their attackers to save their lives along with all of humanity. Featuring eye-popping special effects,the high-stakes action film stars Dan Ewing (“Home and Away), Temuera Morrison (“Once Were Warriors”), and Stephany Jacobsen (“Alex Cross”). “Occupation” will be available on Blu-ray + Digital and DVD for the suggested retail price (SRP) of $21.99 and $19.98, respectively. The edge-of-your-seat thriller “The Row” arrives on Blu-ray, DVD and Digital Tuesday Sept. 25 from Lionsgate. The film currently is available On Demand. Horror comes to campus in this modern take on the classic slasher film. As Riley (Lala Kent, “Vanderpump Rules”) and her best friend, Becks (Mia Frampton), begin their freshman year of college, they consider joining a sorority. But when the mutilated body of a student is found, everything changes. Riley’s father Cole (Randy Couture, “The Expendables” franchise), a detective, takes it upon himself to investigate the murder in an effort to protect his daughter before it’s too late. “The Row” will be available on Blu-ray and DVD for an SRP of $21.99 and $19.98, respectively. RLJE Films will release the Fangoria horror film “Puppet Master: The Littlest Reich” on DVD, Blu-ray and 4K UHD/Blu-ray combo Tuesday Sept. 25. Written by S. Craig Zahler (“Bone Tomahawk”) and co-directed by Sonny Laguna (“Wither”) and Tommy Wiklund (“Wither”), “Puppet Master: The Littlest Reich” stars Thomas Lennon (“I Love You, Man”) Jenny Pellicer (“State of Affairs”), Nelson Franklin (“Black-ish”), Charlyne Yi (“Knocked Up”), Michael Pare (“Eddie and the Cruisers”), Barbara Crampton (“You’re Next”) and Udo Kier (“Downsizing”). Edgar (Lennon), recently divorced, returns to his childhood home where he finds a nefarious looking puppet in his deceased brother’s room. He decides to sell the doll for some quick cash at a small-town convention celebrating the 30th Anniversary of the infamous Toulon Murders. All hell breaks loose when a strange force animates the puppets at the convention, setting them on a bloody killing spree that’s motivated by an evil as old as time. “Puppet Master: The Littlest Reich” will be available on DVD for an SRP of $29.96; on Blu-ray for an SRP of $29.97; and on 4K UHD/Blu-ray combo for an SRP of $35.97. The DVD debut of outlandish Acorn TV Original Series “Sando” arrives Tuesday Sept. 25. Akin to an Aussie “Arrested Development,” this new Australian family comedy stars award-winning actress Sacha Horler (“Jack Irish”) as Victoria ‘Sando’ Sandringham, a charismatic loose cannon CEO and public face of a popular discount furniture store chain. Sando made a name for herself as the “package deal queen” of her furniture empire. But after an outrageous indiscretion at the wedding of her daughter, Susie (Krew Boylan, “A Place to Call Home”), Sando’s family cut her out of their lives. Ten years later, Sando is being forced out of her company, too. With nowhere to go, she tries to worm her way back into her family’s good graces, but they have problems of their own. Susie’s patience is constantly tested by her dimwitted brother Eric (Dylan Hesp, “Raw Comedy”), while Sando’s ex, Don (Phil Lloyd, “The Moodys”), is having an affair with his daughter’s best friend (Adele Vuko, “Underbelly”). As tension builds in the household, Sando races to win back her family and her business. The DVD features six episodes and bonus features including cast interviews, a “Real Deal” music video and more ($39.99, Amazon.com). “Sando” made its U.S. premiere in May on the Acorn TV streaming service. Available Tuesday Sept. 25 from Acorn TV is the DVD/Blu-ray debut of the smash, long-running mystery series “Midsomer Murders, Series 20”. The beloved series follows capable Detective Chief Inspector John Barnaby (Neil Dudgeon, “Life of Riley”) and Detective Sergeant Jamie Winter (Nick Hendrix, “The Crown”) as they investigate the cozy villages of England’s most murderous county. The English village mystery gets a contemporary spin in this hit British television series that has earned a worldwide following. Bucolic settings harbor macabre crimes and eccentric characters that are no match for DCI John Barnaby (Dudgeon); his assistant, DS Jamie Winter (Hendrix); and new pathologist, Dr. Fleur Perkins (Annette Badland, “EastEnders”). Guest stars include Jemma Redgrave, Michael Byrne, Ann Eleonora Jorgensen, Ellie Haddington, Tamzin Outhwaite, Peter Egan, Don Gilet and Andrew Gower. The three-disc DVD/Blu-ray set features six feature-length episodes ($49.99 DVD; $59.99 Blu-ray, Amazon.com). It also contains 27 minutes of behind-the-scenes featurettes. The 20th season of the British mystery series made its U.S. premiere in May on the streaming service Acorn TV. Tackling thorny themes in today’s complex world, Acorn TV debuts the DVD of the final episodes of the gritty and cinematic crime series “East West 101, Series 3” on Tuesday Sept. 25. Set around the Major Crime Squad in metropolitan Sydney, this thrilling Australian series is based on the experiences of actual detectives in a crime unit in Sydney’s western suburbs and deals with clashes of culture, socio-economic statuses and religious tension. In the explosive final series, this award-winning Australian drama sees Detective Zane Malik (Don Hany, “Underbelly”) handing in his resignation, determined to start a new, danger-free life with his family. But when his wife and son are involved in a hit-and-run accident, Malik becomes obsessed with finding the culprit. He connects the crash to the sophisticated robbery of an armored vehicle that left four dead. As the police, led by Superintendent Patricia Wright (Susie Porter, “Janet King”), investigate the robbery, Malik clashes with former army officer Neil Travis (Matt Nable, “Arrow”). Travis is quick to blame the attack on Muslim extremists, but Malik suspects there is more to the case. Guest stars include Danielle Cormack (“Rake”), Aaron Jeffery (“X-Men Origins: Wolverine”), Richard Carter (“Mad Max: Fury Road”) and Tammy MacIntosh (“Miss Fisher’s Murder Mysteries”). The two-disc DVD set features seven episodes, plus a bonus behind-the-scenes featurette ($39.99, Amazon.com). “East West 101, Series 3” is also available on Acorn TV. Get set for mystery and intrigue on the streets of London with Warner Bros. Home Entertainment’s release of “C.B. Strike: The Series,” the compelling detective drama adapted from popular crime novel trilogy by Robert Galbraith, a pseudonym for J.K. Rowling. Available in stores Tuesday Sept. 25, the TV drama features all seven riveting episodes from the new Cinemax mystery series plus bonus content. Starring Tom Burke (“War & Peace,” “The Musketeers”) and Holliday Grainger (“Cinderella,” “Lady Chatterley’s Lover”), “C.B. Strike: The Series”—follows war veteran turned private investigator Cormoran Strike, who solves some of London’s most complex murders with the help of his assistant Robin Ellacott. Meet television’s next great detective, Cormoran Strike (Tom Burke), a war veteran turned private detective who operates out of a tiny office in London’s Denmark Street. He is wounded both physically and psychologically but his unique insight and his background as an SIB investigator prove crucial in solving complex cases, which the police seem unable to solve. Robin Ellacott (Holliday Grainger) is Strike’s new office temp who is in charge of managing his chaotic life. She soon becomes involved with his caseload and begins to see her true potential. Together they crack some of London’s most intriguing cases. The bestselling book series has sold over four million copies globally. “The Cuckoo’s Calling” was published to critical acclaim in 2013 and went on to be a global bestseller. “The Silkworm” was published in 2014 and “Career of Evil” was published in 2015. “C.B. Strike: The Series” is executive produced by Rowling, Neil Blair (“Fantastic Beasts and Where to Find Them”), Ruth Kenley-Letts (“The Casual Vacancy”), Elizabeth Kilgarriff and Tom Edge (“The Crown”). The two-disc DVD set contains seven episodes and will retail for $24.98 SRP. The series also is now available to own on Digital via purchase from digital retailers. From creators Ryan Murphy, Brad Falchuk and Tim Minear (“American Horror Story”) comes the new procedural drama “9-1-1” available Tuesday Sept. 25 on DVD. The freshman series explores the high-pressure experiences of police officers, paramedics and firefighters who face the most frightening, shocking and heart-stopping situations. The series stars Angela Bassett, Peter Krause and Connie Britton. 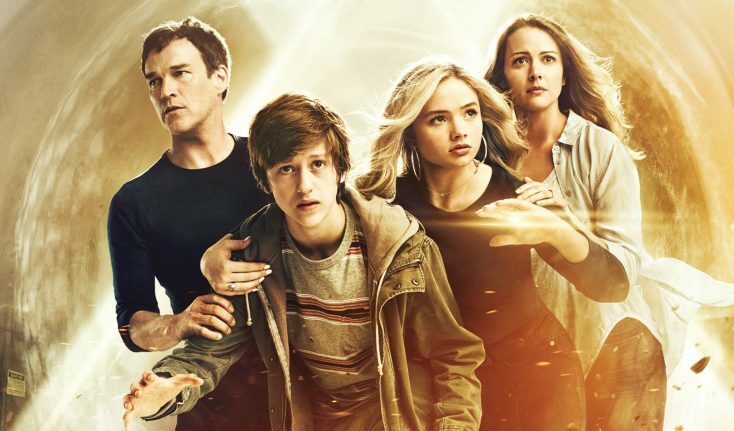 Fox’s “The Gifted” tells the emotional story of a suburban couple whose ordinary lives are rocked by the sudden discovery that their children possess mutant powers. The complete first season of the sci-fi show is available on DVD Tuesday Sept. 25. Forced to go on the run from a hostile government, the family seeks help from an underground network of mutants and must fight to survive. Set within the “X-Men” universe, the series stars Stephen Moyer, Amy Acker, Natalie Alyn Lind and Percy Hynes White as the Strucker family. Featured in the series are Sean Teale as Eclipse/Marcos Diaz; Jamie Chung as Blink/Clarice Fong; Emma Dumont as Polaris/ Lorna Dane; Blair Redford as Thunderbird/John Proudstar; and Coby Bell as Sentinel Services Agent Jace Turner.